When homeowners face some of the smaller plumbing problems, if they’re handy around the house, they will often be able to sort out the problem on their own. When it comes to bigger plumbing problems, it’s usually best to call out a plumber. Look for professional plumbers in your area, as they will have experience with common plumbing problems in your neighborhood. When homeowners try and deal with complicated plumbing problems on their own, it could lead to an even bigger problem that will ultimately cost them more money than if they just got a plumber in to repair the original problem. Find out more about when it’s best to phone up a professional for the job. Having regular maintenance on your plumbing won’t cease plumbing problems, but it will help in preventing them from occurring. Many pipes are behind walls or under the floor. Without an inspection, when a plumbing problem arises, there is often no way of noticing it before it turns into a larger problem. Plumbing problems often involve leaks, and if these go unnoticed or ignored, they can lead to water damage and affect your home’s structure. Water damage can also cause mold to grow, and it can discolor and warp any wood in your home that was affected. By getting a thorough inspection and maintenance check on your home’s plumbing system, you can prevent the negative problems from materializing. There are some maintenance tasks that homeowners can carry out themselves, such as checking any visible pipes in their home for signs of corrosion, damage or dampness and flushing the toilets to ensure there are no leaks in the base. They can also check the water pressure by turning on the sinks, showers, and bathtubs faucets – they should have a similar and even flow, and homeowners can also check for any potential clogs by filling up their sinks and then letting the water drain out. If the water moves slowly, this could be a sign of a clog in the making. It is always best to call in a plumber for a thorough maintenance check. Plumbers will know exactly what they are doing and what warning signs that they need to look out for. Most plumbing inspectors will check your garbage disposal, your water heater, detect any hairline leaks by using a pressure test, maximize the flow rate by using a drain treatment, and thoroughly check all of the plumbing systems in your home. A more intense inspection may also include lead testing and inspection of pipes using video. Leaks are a very common plumbing problem that should not be ignored. In some cases, they may not be noticeable until an inspection is carried out or until water damage is visible. Most of the time leaks develop at the pipes joints. You can buy temporary fixes such as joint fillers at your local hardware store, but it’s best to get a plumber out to repair the problem. It may cost you more money than buying joint filler but a repair carried out by a plumber is not temporary, the joint filler is. Some time or another you’re going to have to spend the money on a proper repair – better sooner than later. 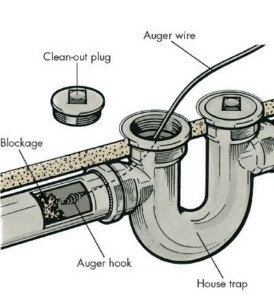 Some pipe repairs such as a leaky U-bend aren’t complicated, but they can be chaotic if they are done wrong. You can use products such as leak tape to temporarily stop the leak while you are waiting for your plumber to arrive. When your home has a drippy faucet, it’s quite easy to ignore it as long as the dripping noise isn’t keeping you up at night. A lot of homeowners will be surprised at the amount of water you waste when a faucet is trickling all day. If you want to see how much water you are wasting, place a jug or bowl under the affected faucet for the day. After you have taken note of the amount you’ve collected, you could put the wasted water to good use by boiling it for a cup of coffee or using it to water any plants. A drip doesn’t just waste water; it also wastes your money. You can tell if you have low water pressure by turning on a faucet and monitoring its water flow. If the water is trickling out, it’s very likely that you have low water pressure. Low water pressure isn’t always due to a problem in your home’s pipes; it can also be caused by the municipal water supply. When you have run water into your sink or bathtub, and it’s draining slowly, you could have the beginnings of a clog. A quick plunge may dislodge the clog a little, but it doesn’t break the clog up. It’s not advised to use over the counter drain cleaners as these can damage your pipes. It can cause plastic pipes to soften and copper or lead pipes to corrode. When you are dealing with a clog, it’s always best to leave it to the professional plumber. All of our trucks are fully equipped so we can immediately handle all repair issues – all makes and models!